The acromioclavicular joint is usually injured from trauma, such as motor vehicle or sports injuries. It can also be injured with repetitive microtrauma. The acromioclavicular joint is located at the top of the shoulder where the acromion joins the clavicle. Fractures of the acromion or clavicle can cause acromioclavicular joint pain. However, acromioclavicular joint pain can also be caused by tears of the ligaments that surround and reinforce the joint. A fall onto an outstretched hand (FOOSH) injury has also been implicated in causing acomioclavicular joint pain. Acromioclavicular joint injuries are classified on a scale I to V based on severity, with grade I being the least severe and grade V being the most severe. 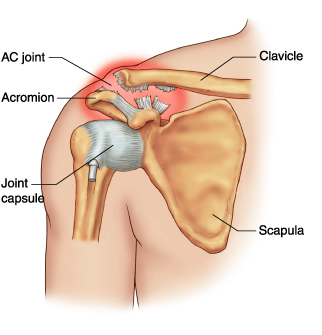 The pain of acromioclavicular joint injury is felt in the shoulder. The patient may complain of a grinding sensation in the shoulder and it may be difficult to sleep on the affected side. The pain is made worse by reaching across the chest. X-rays and MRIs of the shoulder are useful to delineate the problem and exclude other causes of pain. Blood work will look for causes of pain such as infection or autoimmune disorders. Treatment of acromioclavicular joint pain begins with conservative modalities such as physical therapy, heat, ice and non-steroidal anti-inflammatory medications. Injection into the joint of a dilute solution of a local anesthetic and a steroid can be useful to decrease the pain and allow physical therapy to be more effective.